Curated in partnership with The Saturday Paper and The Monthly, this is not a European holiday but rather an invitation to step into a world of art. Picasso once said that art exists to wash the dust from our souls, and this is an experience that will do just that. Whether you spent semesters studying Caravaggio or simply enjoy a stroll through contemporary galleries, this is a journey designed for you. Explore Europe as you never have before. Visit the Venice Biennale, where we meet with Australian representative Angelica Mesiti, dine with the curators and directors of Europe’s finest galleries, and attend Milan Fashion Week. The specialist host for our journey is Jason Smith, director of the Geelong Art Gallery who previously served as head of Australian art at the Queensland Art Gallery, director of Heide Museum of Modern Art, and assistant curator of the NGV. Jason will lead discussions with artists, curators and designers, as well as providing an insider’s perspective into everything we see and do. We have curated a range of experiences that can only occur once, including private viewings and dinners with François Quintin, Executive Director of Lafayette Anticipations, and Laurent Le Bon, Director of the Picasso Museum. 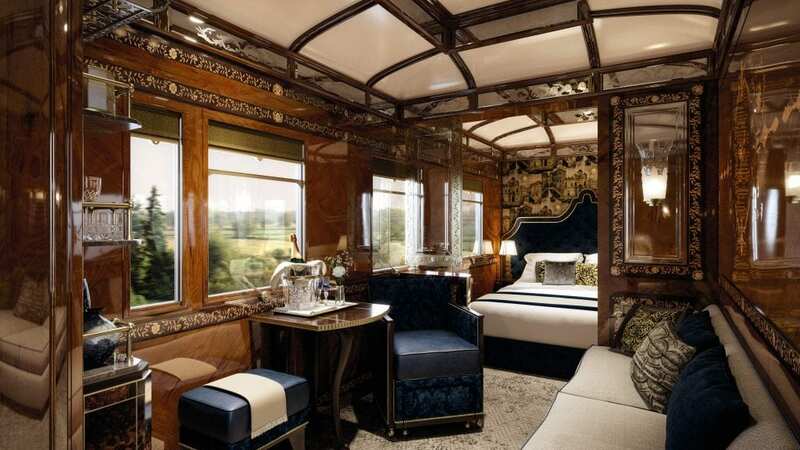 From private limousines to the carriages of Venice Simplon-Orient-Express, Michelin-star restaurants to residences such as Le Royal Monceau-Raffles Paris, everywhere you stay, everything you eat and every mode of transport is of the highest calibre. We touch down in the French capital and meet private limousines for the journey to Le Royal Monceau-Raffles Paris. Later, at the hotel’s Michelin-starred Il Carpaccio restaurant, we are welcomed with cocktails and canapes. Wander through the hotel’s private gallery, showcasing works by Jeff Koons, Banksy, Rubenstein and more. Discuss the Parisian art scene with our host, Jason Smith, as he leads us through the Louis Vuitton Foundation and the François Pinault Foundation. You might also choose to visit the Louvre Lens, located 200 kilometres outside of Paris. Hosted by the foundation’s executive director, François Quintin, enjoy a rare private viewing and exclusive dinner at Lafayette Anticipations – Fondation d’entreprise Galeries Lafayette. We join the Venice Simplon-Orient-Express for the journey through the beautiful Swiss Alps to Venice. Over dinner, Jason Smith chats about the Venice Biennale, advising us on what to look for over the next few days. We arrive in Venice and make our way to Hotel Danieli, a classic landmark located steps away from the Bridge of Sighs and the Piazza San Marco. Our discovery of the Venice Biennale begins at the Australian Pavilion, where Australian representative Angelica Mesiti takes us through the work she is exhibiting. With Jason Smith, we dive further into Biennale, including a guided visit to the Arsenale exhibition space, showcasing radical and thought-provoking contemporary art. A private dinner awaits us within the walls of the Victoria Miro Gallery in the San Marco district. The following day, we return to the Biennale, however some may prefer to take time out from the art world with an afternoon devoted to the fine food and wine of Venissa Winery, situated on a private island. Tonight, we don our disguises and partake in the old Venetian tradition of masquerade with a private dinner and ball at Hotel Danieli. There are two options for the journey to Milan. Leave early and stop off at Lake Garda, enjoying lake views during lunch in a private terrace at La Speranzina Restaurant & Relais. Or, travel to Milan by train and spend the afternoon exploring at your own pace. In the evening we all meet again at our Milan residence in the fashionable Quadrilatero district, the Mandarin Oriental. Feel the energy on the streets during Milan Fashion Week, one of the world’s ‘Big Four’ fashion weeks and arguably the most anticipated. Over a full day, explore hidden ateliers and showrooms, and marvel at the latest luxury designs for the Spring/Summer 2020 season at a runway show. During a private viewing at The Prada Foundation with its curators, we consider the latest contemporary installations at the newly opened six-floor tower. Then, at Milan Osservatorio, take in beautiful imagery from some of the world’s leading photographers. On our final evening we make our way to Seta, our hotel’s two Michelin-starred restaurant, for a private farewell dinner. Our journey through the world of art comes to an end as we meet our flight bound for Australia.